The team of Wolgast Corporation and Wolgast Restoration was created to be a high level provider of full-service restoration services to deal with all of your challenges when mayhem strikes your building. Wolgast Restoration specializes in residential and commercial restoration when it comes to structural damage from water, fire, wind, or other mishaps. And Wolgast Corporation is a commercial contractor who has specialized in buildings of all shapes and sizes since 1948. So, what are the benefits of having your restoration company on the same team as a general contractor? The communication and actions to start planning the reconstruction portion of your project (if it’s needed) flows fluidly through the company as the experts in charge of your building talk freely and regularly. Also the strength and resources that Wolgast Corporation has developed over the past 70+ years provides a solid foundation for Wolgast Restoration to handle projects of any size. During the clean-up portion of a project, project technicians can assess the situation and keep the construction staff informed of what’s needed and the construction staff can be estimating budgets, planning for materials, obtaining permits and organizing team coverage. All this is done without much effort on your part, because when you have endured mayhem, the last thing you want is to be burdened with is making phone calls and searching for an unknown company to preserve your building. Wolgast Restoration is providing its services through the same systemized approach that Wolgast Corporation uses to provide its construction services. We find that having this systemized approach allows us to provide the most uniform and quality service for each unique job. It helps us move quickly to the next task rather than pause to determine what to do next, all to the benefit of our clients through time savings. We have offices in Saginaw and Kalamazoo areas. 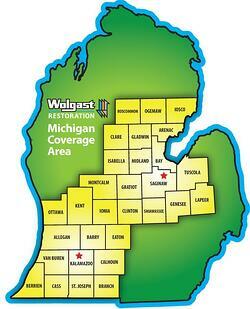 If mayhem strikes you, please don’t hesitate to strike back with Wolgast Restoration. Call 855.965.4278 to take immediate action. In the meantime, if you have questions, please visit www.wolgastrestoration.com or call 989-790-9120 when it isn't an emergency. In a high stress situation of a Catastrophe (CAT) Loss, it’s easy to forget that insurance carriers and restoration companies are working toward the same goal: restoring a property to a pre-loss condition while satisfying the policy holder efficiently. Meeting the customer’s needs can be taxing for both ends of the spectrum whether it’s matching coverage expectations or the speed and manpower expectations, all while numerous other customers are also calling to notify you of their needs. Wolgast has a plan in place to support insurance carriers during this harried time. We know the importance of moving quickly to reach the optimum number of policy holders and following through with quality service to keep them happy. As a systemized company, we use a carefully constructed and laid out CAT protocol/process and are prepared to reach a wide variety of property owners in a short amount of time, plus we have the capacity and resources to effectively handle their restoration needs by drawing from our general construction division and its staff when necessary. This system guides us to know the manpower that we will need, the responsibilities of each staff member and the communication necessary to remain responsible, accountable and organized. Also, with two locations in Michigan, one near the center of the state in Freeland and one in the southwest in Kalamazoo, we’re ready to cover a large portion of Michigan to readily help you serve your clients. We are specialized handle any size claim for both commercial and residential property owners. Please contact our 24-hour hotline at 855-WOLGAST in the event of an emergency. Download our White Paper, “Reduce the Effects of a Disaster on Your Business” at: www.wolgastrestoration.com/reduce-the-effects-of-a-disaster-on-your-business to learn the details about how we do this for Businesses. Certified restoration contractors are required to meet a strict set of standards, dictated by insurance companies and industry organizations to restore property to its pre-loss condition. If a restoration project is done improperly, it can result in mold growth or other toxic hazards that can cause serious health issues for the occupants. General contractors and construction companies who mostly build new construction do not have adequate insurance restoration experience. They lack the equipment, experience and certified training required to perform water mitigation, smoke odor removal, content restorative cleaning, deodorizing and handling techniques. Also, they may not understand the proper methods for reconstruction and repairs under these unique conditions, not to mention how to identify and deal with the hazardous materials and dangerous structural conditions, after a disaster. Carpet cleaning and house cleaning services are great for everyday, small-scale cleaning jobs. But when it comes to flooding, fire, and smoke damage, they don’t have the technical capabilities or knowledge to remove high levels of moisture that infiltrates the floors and walls, causing dangerous mold to accumulate in a matter of days. Smoke damage also goes far beyond the soot that is left on walls, ceilings and furniture. If not cleaned and deodorized properly, it can leave behind microscopic toxins and fine particulates that can be hazardous to the health of the occupants. Years of experience and extensive training are required to be a certified restoration contractor, and obviously, there are many good reasons for that. 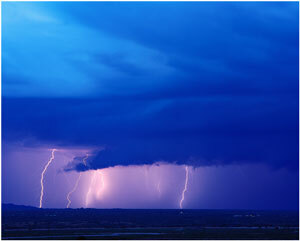 Are you prepared for the potential storms that accompany it? In the spring, we turn our clocks ahead one hour and our thoughts to warmer weather and the activities we love. We plan barbecues, picnics, ballgames, camping and a wide variety of other outdoor activities. No one likes to cancel outdoor activities, but when severe weather threatens, we need to prepare for the possibility of damages occurring not only to ourselves, but also to our home and business. Thunderstorms, hail, rain and tornadoes cause varying degrees of damage. *Check the local weather report for your area or your destination (weatherchannel.com or local news or radio station) to see if there is a chance of severe weather. You may need to change your plans, or at least wait until the threat of severe weather has passed before heading out. *Remember that storms can develop quickly and without a lot of advanced warning. Having an emergency kit in your home and vehicle can provide you with much-needed necessities if caught without power or you are stranded. Remember that disaster can strike at any time, and most people are not prepared for it, even though they may think they are. Being prepared for any emergency will help to alleviate stress when disaster does strike. There are a lot of hazards associated with wet or high moisture basements. There are increased respiratory problems, harmful mold, long-term damage to the structure and equipment, personal property damage and possible decrease in house value. Not to mention the inconvenience and hard work to fix the problems. The number one inconvenience for most is the cost, which can add up to tens of thousands of dollars in damage. 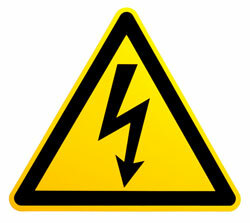 Do not stand in water and reach for any electrical items. If possible, wear rubber boots and if you have to touch any electrical parts use a wood or plastic item – better still, call an electrician. Safety should always be number one in your mind with water and electricity. Mold can set within 48 hours with standing water. There may also be sewage contamination that would also have to be considered. The faster you can remove the water and get the structure dry the less severe your loss will be. Don’t wait for approval from your insurance provider to remove the water, do what you must to remove it quickly. Take photographs and put dates and descriptions on them for your insurance company. If the job is too big for you, please call a reputable restoration company to help get you dry and explain what must be done to protect you from further problems such as mold. Always explain what coverage you have with the restoration company as sometimes they’ll do more work than you have coverage, leaving you with a huge bill you can’t pay. Again, please discuss fully with your agent for proper coverage amounts. This will help when you have a loss and you know what you are able to pay yourself. Put your personal belongings on shelves to keep out of water’s reach. Furniture with legs will help keep the water out of the material, but raise and pin the skirt if it has one. If your basement has high moisture, run a dehumidifier, especially in the summer when outside moisture is high. Unfortunately, many people don’t realize that you are required to buy additional coverage for any water back-ups that occur in the basement and sometimes under estimate the coverage that they purchase. Roughly 22% of all residential insurance claims are from sump pump overflows and burst pipes. It’s in your best interest to thoroughly discuss this coverage with your insurance agent in determining the right coverage and discuss what may not be covered as well. Be safe and dry in your own home. Your home is your castle – treat it that way and it will pay you back. 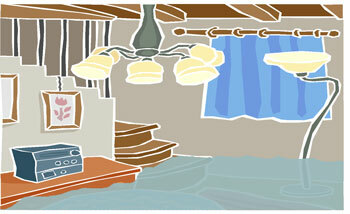 Just because the snow is gone doesn’t mean you’re past the danger of a flooded basement. The ground is still frozen and in the process of thawing when the spring rains come, therefore, the ground is too saturated and/or frozen to absorb the water. The water then flows down the easiest path which is usually to your foundation wall and into your basement. Sump pumps can help filter water out of your basement when they’re working properly; however, there are many things that can go wrong with a sump pump at the wrong time. For instance, it can fail due to age, continuous use can burn up the motor, debris in the basin can block flow, the “check” valve fails, or the weep hole or filter can get clogged. Other problems that can lead to flooding are from municipal infrastructure malfunctions. A sanitary sewer pipe is designed to remove wastewater from your home (i.e. toilets, sinks, floor drains, and can include your weep tiles around your foundation, etc). If excess storm water enters the sanitary sewer system, it can overload the system and send it back into your house (usually if the fixtures or drains are below the surcharge level). The same thing can happen with a storm sewer that’s usually larger than the sanitary sewer, but designed to carry larger amounts of flow. Your landscaping can also contribute to a flooded basement. When the ground around your foundation slopes toward the house, the rainwater naturally flows in the sloped direction. In most cases, your weeping tiles will carry the water away without issue, but at some point the water could overload the system and find its way into the foundation walls. The same goes for window wells, so slope away from them, too. Another cause could be your eaves troughs and downspouts. Do your downspouts extend at least 6’ away from your foundation wall? If not, the water could overload your weeping tiles. Are they still plugged from fall with pine needles or leaves? Do you see water over flowing from the gutter in the center of your house? When you have an unexplained flooding problem, start first at the eaves troughs and downspouts, and then look at your landscaping and foundation drainage, then to sewer/sanitary drains and finally, the interior plumbing. 1) Keep the gutters and downspouts clean of debris, check for cracks (especially at the connections). Have the downspouts out 6’ from your foundation. If they still spill over in heavy rains replace them with a larger size. 2) The ground around your home settles and can slope towards your foundation, fill it in and grade the lot so it slopes away from the house at least 6’. 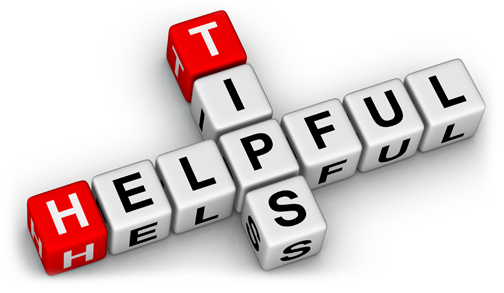 3) It’s difficult to determine whether you have weeping tile problems, but if the source of the water can’t be found it’s probably time to hire a company with a camera to snake the drains and see if you have a crushed tile or plug. This would also determine if this is in the sanitary or storm drain. (Usually if water or sewer is coming up through your drains in the floor or through a basement shower drain this is external backup). 4) Last, but not least, the Sump Pump. Make sure the discharge pipe is free of debris and discharged out into your property where it can be absorbed, such as your lawn or garden. Next, make sure the pit is cleaned each year as the weeping tiles can carry small amounts of sand or debris into the pit. Check and test your pump each spring (can check by pouring water into the pit until the pump kicks on). Remove and clean the pump once a year. Always disconnect the power source before working on the pump. Check once a month for debris in the pit. A good back up for the sump pump is a battery backup that will kick on when you lose power from a storm. There are a variety of backups and some that have an audible alarm or can call your phone to notify you of a power outage. There is also a backwater valve that prevents sewage from backing up into your basement, ask a plumbing company. Does Proper Attic Ventilation Prevent Ice Dams? Every once in a while in Michigan, we are known to get some snow. With our varying weather and temperatures, we are at a high risk of getting ice dams. 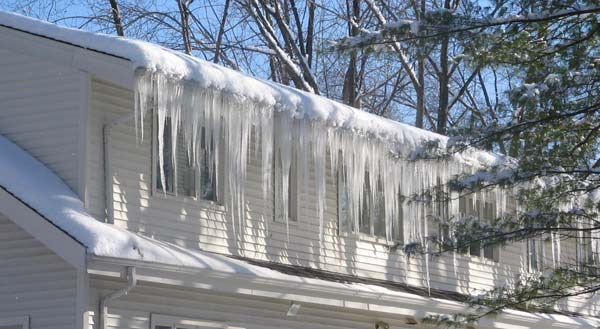 Below are some reasons and solutions to stop Ice Dams before they start. 1) Warm air rising to the peak of the attic. 2) Cold air at the lower part of the roof (warm air rises), especially just above the eave where the temperature is about the same as outdoor air. 3) Heavy snow coverage of the roof. This acts as a layer of insulation, preventing heat loss, therefore it makes it warmer in the attic. When all 3 of these conditions happen, ice dams can form quickly. The heat at the peak of the roof causes the snow to melt and flow to the eave. Since it is freezing at the eave, this melted water refreezes and allows the water to backup and cause ice dams. The damage includes gutter, fascia, landscaping and water infiltration under the shingles. Insulation can become wet, both exterior and interior wall cavities, drywall/paint damage and mold or mildew can form. Some extreme cases can cause ceilings to collapse. Yes it does, especially in Michigan’s climate with snow and frigid temperatures. But, it is also needed in the summer months to keep the attic cool. There are two main purposes of attic ventilation; to protect against damage to your structure and to reduce energy usage. A well ventilated attic during the warmer months helps cool the attic down. During the winter it helps to reduce moisture to keep attics dry – which prevents ice dams and mold. On a hot summer day, the sun hits the roof, travels through the sheathing and heats up the attic space. This heat radiates to the attic floor and into the adjacent living areas raising the temperature. The attic floor can have temperatures as high as 140 degrees (with only 90 degrees outside). Not only does this cost you money in trying to cool the space, but will cause damage to the roof shingles in early deterioration down the road. This can lead to water leaks and expensive roof repair and/or replacement. In the winter, the warm air from the living areas transfers into the attic and if it isn’t released by ventilation, it can cause problems. This moist air hits cooler rafters, trusses and roof sheathing causing condensation in the form of frost or droplets falling on the materials, which in turn can cause mold and rotted structures. 1) Install proper attic ventilation. The most efficient and effective systems use ridge vents and an evenly distributed layout of intake vents. 2) Install proper attic insulation. It prevents heat loss from the living areas and diminishes the energy impact of having cold air flow through the attic. 3) If possible use waterproofing shingle underlayment (WSU) (snow & ice shield) at least 2’ above the interior wall line (would recommend 3’). Valleys should be 3’ on each side of the valley center. First and foremost, be safe. Do not use an axe or ice pick as this can cause bodily injury and/or roof damage. After a good snow fall, remove the snow off the roof with a roof rake. Use a good rake that has wheels at the bottom of the rake to prevent roof damage. Our recommendation: If it is not safe or is too hard to do, use a professional.